Click here to see the book on Amazon. Look inside! “What do you love? What do you not-so-love? What bugs you at school or at home? 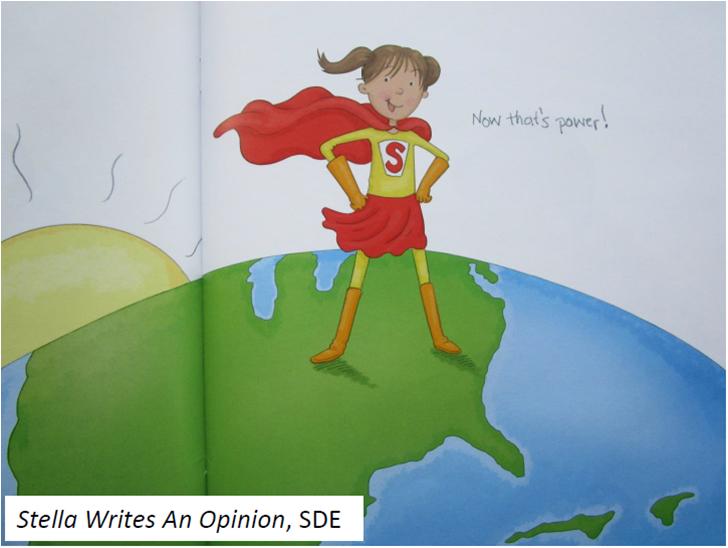 What would you change if you were in charge of the world, or your class, or your bedroom?” Here are the words of Stella, the peer writing mentor your students don’t want to miss. Why? Because she is real. Because she is just like your K-4 writers. And, because she works through writing by explaining, reflecting, problem solving, and celebrating while sharing her thinking all along the way. 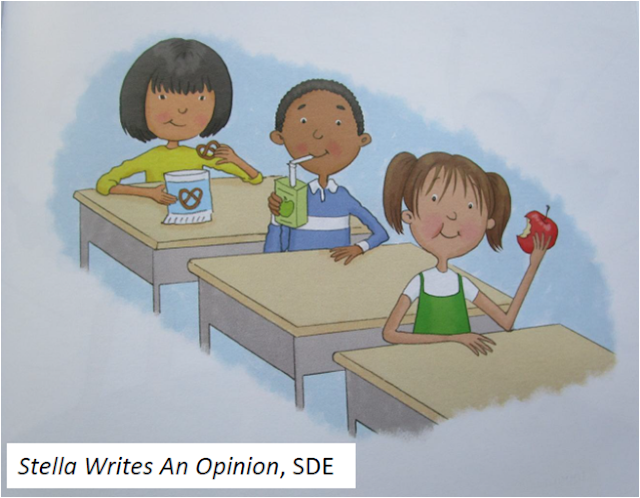 These quotes are from the picture book Stella Writes An Opinion published by SDE (Staff Development for Educators). It is just one in a series of four engaging picture books designed to delight, inspire and mentor young writers. 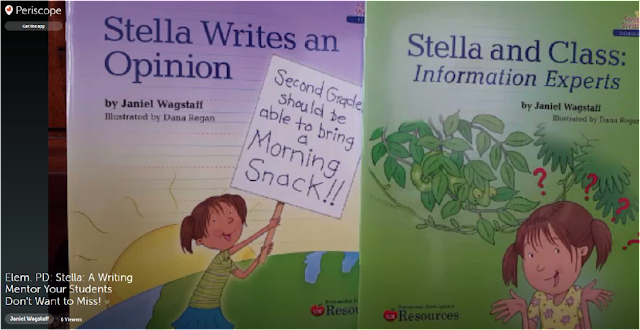 In this book, as in the others, Stella, with the help of her teacher and classmates, walks her way through the entire process of writing in the genre. After defining opinion, she brainstorms topics, picks one, and explains her thinking: “See, I’m in second grade. In kindergarten and first grade we got to bring a morning snack if we wanted, you know, to keep us going ‘till lunchtime. Now, we can’t bring one anymore. We’re too old. That bugs me, and if I was in charge it’s something I would change.” Now, what kid can’t relate to that? The best part about the #Stellawrites series is just this: each book makes the genre and process accessible to writers—the scenarios are completely kid-relatable. 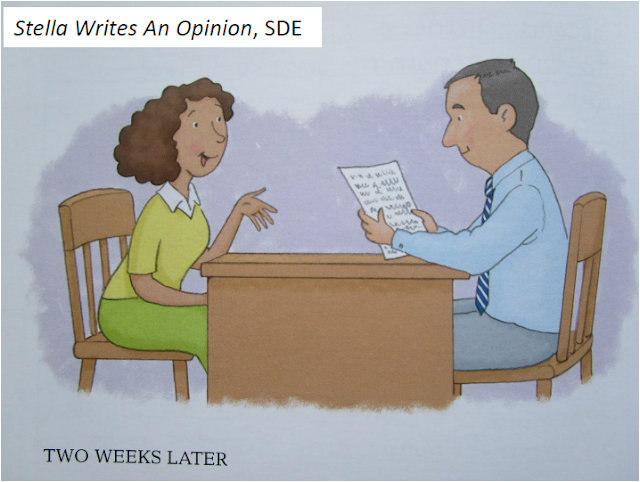 Stella learns from her teacher, Ms. Merkley, she needs reasons to support her opinion, "You can't just say what you want, or what bugs you, or what you'd like to change. To write a good opinion, you have to have reasons to support it. Reasons!" She ponders aloud and comes up with two reasons for her opinion, one of which is: "I get grumpy when I'm hungry. I mean grumpy like snappy at my friends or classmates. "Don't touch that!" "I know! I know!" "Stop making that noise!" They call this low blood sugar. Does that ever happen to you?" Naturally, like so many of our writers do, Stella prematurely thinks she's done at this point. But, then Ms. Merkely instructs the class on closings. Now, Stella gets really stuck. She can't think of a closing that fits and sounds like her. She tries multiple endings (all of which are shown), thinks and rethinks, even on the school bus and at home that night. Finally, she perseveres and comes up with something she likes, "To conclude, morning snacks are important! We should bring them back for second graders. When our stomachs are happy, we're happy kids who can learn better because we can concentrate. And, that's what school is all about." "Yes! I like that one! It sounds like me, and it reminds everyone why my opinion deserves attention. I'm glad I tried writing a few different endings, or I never would have come up with that one." Stella decides to "do what good writers do" and reread her writing to "make sure it says what I want it to say and sounds like I want it to sound." Her draft and revisions/edits are shown in the book and she challenges readers to find some of her changes. Lastly, and this is something I ADORE about these books, the writing concludes with purpose. (When students' reading, writing, and conversations have real purpose, engagement and learning outcomes increase exponentially.) 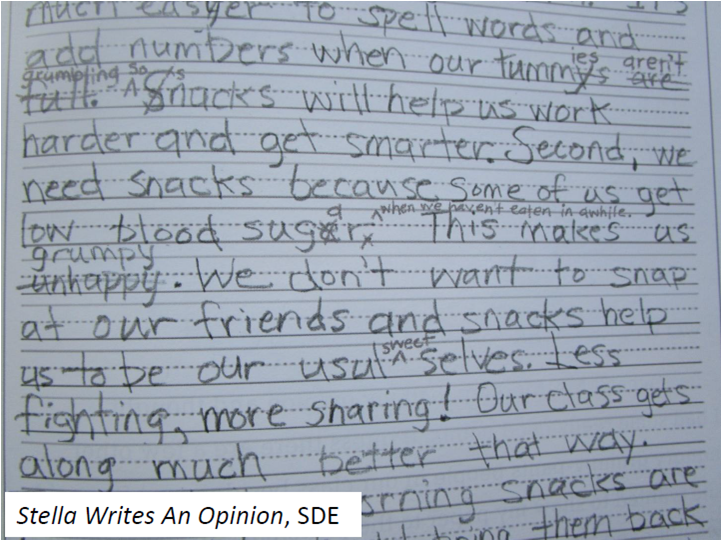 Stella's opinion is shared with the principal who agrees the policy on student snacks should be changed: "Once he read it, he agreed! We get to start bringing morning snack next week! See, I told you opinions are powerful. Who knows what we opinion writers might change? The world needs us!" Now, that's empowerment! When our writers are empowered, they put forth more effort, see the reasons behind what they're doing, get the "bigger picture" and are more likely to engage in reading and writing for their own purposes outside of class. This week, I shared a Periscope broadcast to highlight the #Stellawrites series. You can view the broadcast here. 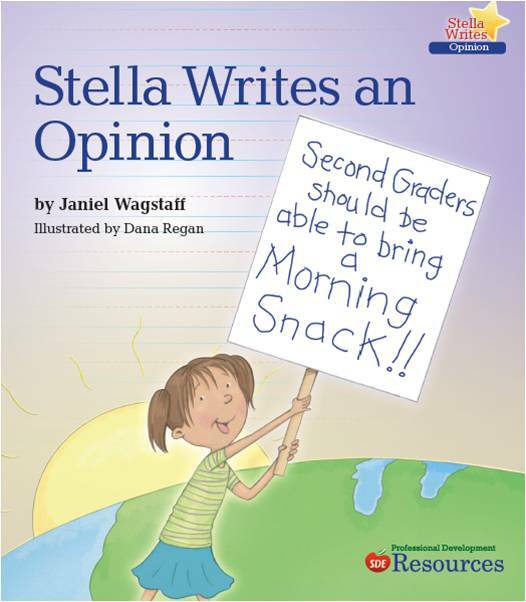 Stella Writes An Opinion is featured during the first ten minutes. Stella and Class: Information Experts, the book about informative writing, is featured in the second half of the broadcast. Thanks for visiting! Stay tuned for more great things from Stella! P.S. Here's a little recent praise for Stella. The books were featured on the Two Writing Teachers blog. You can view the post here. -"Really liking Stella's "can do" attitude! That's what I try to instill into all my students." -"A heroine who inspires other kids to write...Stella sounds like someone I want to introduce to teachers and students alike. Excited to see the books!" -"What an amazing idea! I can't believe we haven't seen anything like this before. 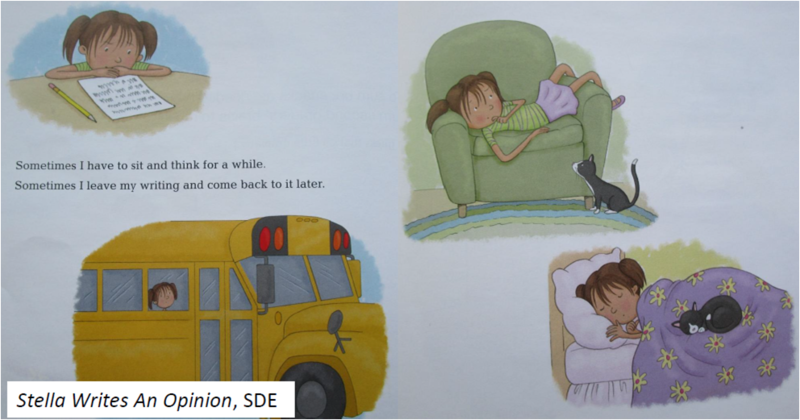 I love using mentor texts as a model with students, but this offers a new way."